Add variety to your cocktails with this easy Honey Simple Syrup. Post may contain affiliate links. Click here to pin this Honey Simple Syrup now! The other day I was getting ready to make a cocktail and instead of the usual simple syrup it called for honey simple syrup. I sat there staring at the page, thinking, why hadn’t I thought of that before? I love honey. I love all the different varieties of honey and how the flavor can vary depending on the diet of the bees. Not only does honey taste good, but it also has vitamins and minerals that we need so using honey to sweeten is a win/win situation. I used to have a local supplier of honey, but they have closed up shop – as a matter of fact the above jar is one of their last. I’m not sure where I’m going to find my honey now. This Organic Honey sounds promising. 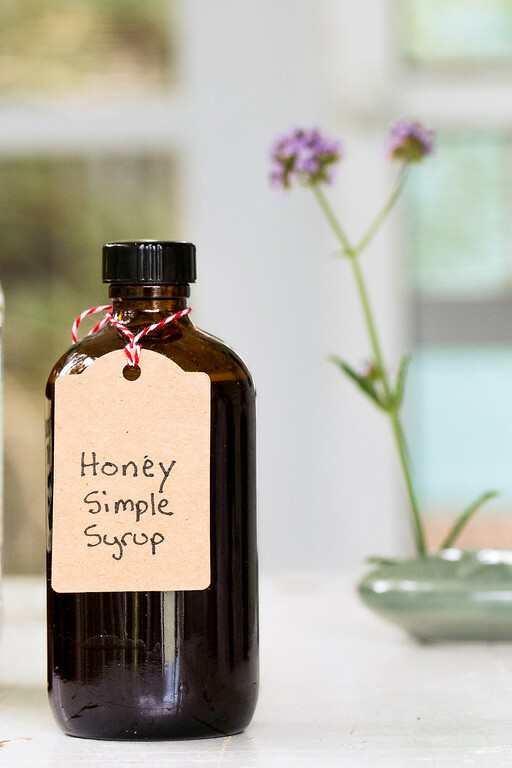 Honey simple syrup is so simple. It’s basically just like any other simple syrup, equal parts sweetener and water. Like other simple syrups you can vary the amount of sweetener to make a heavier, sweeter syrup – like a 2:1 or even a 3:1 . I love this simple syrup and have been using it in a lot of cocktails. It adds a bit of honey’s earthiness to the drinks. If you liked this simple syrup, you should try my: Thyme Simple Syrup and my Rosemary Simple Syrup. Honey makes an earthy simple syrup that goes great in cocktails or other beverages. Place honey and water in a small saucepan. Heat over medium-low heat stirring until honey dissolves. Store in a lidded jar in the refrigerator. I like the fact that you use raw honey… I have one question though… for how long do you think you can store this syrup? Yesssssss! And it’s raw honey which is even better. You always deliver. I love using honey simple syrup for a little nuance in cocktails! What a fabulous idea. Pinning it so I don’t forget. I love the taste of honey and it would add so much to a cocktail, instead of just the sweetness of a sugar-based simple syrup. What a great idea, Pam! I love the idea of using honey for simple syrup! Pinned and sharing. Thank you for being a part of the Hearth and Soul hop. So obvious, so simple, so overlooked. You’ve opened my eyes – thankyou.